On arrival at the Mimosa, we were pleased with our rooms and the cleanliness of them. They were big enough for me and my son. The furniture was modern and the view was fantastic, overlooking the main road and beach. During the first night there was a lot of noise from the main strip, which considering we had stayed across the road in the previous year, was surprising. The patio doors did not have good sound proofing. What was even worse was that the cleaner and her trolley were very noisy every morning from 8am!! She often shouted at the top of her voice to other cleaners without any thought of the guests and on a few occasion actually got into arguments with guests when they asked her to be quiet. A big plus was that the rooms were cleaned almost daily and fresh towels were left. We were half board, getting our breakfast (which despite the cleaner�s best efforts) we only got up for twice. This was very nice, fresh toast and either scrambled eggs or beans to order. The evening meals were disappointing, with the chicken being under cooked, prawns being pink and transparent, and there rarely being the full children�s menu available. The service was rushed and at times unfriendly, and trying to get served drinks at your table near impossible. If you are not a fussy eater then you will probably find enough variety on the menu to keep you satisfied. The location of the hotel was excellent, everything on your doorstep, but having visited Sidari for 8 years, this is my least favorite accommodation. Hotel was spotless, rooms cleaned daily, bathroom had a proper shower cubicle not your usual hole in the floor. Everywhere tiled out. looked as though it had just been done. Hotel in three blocks and the rear was still being refurbished. Two pools, cleaned every morning. poolside snacks available all day. Waiters very efficent. Worked from 730 til after 2300. Choice of 3 cooked breakfasts (charged extra) or ceral, fruit, toast. choice of 3 main meals but only one dessert. Hotel full of "oldies" when we were there but entertainment on nightly from karaoke to bingo, quiz nights to club singers. sky news on all day so you got the breakfast headlines. Our hotel room faced the front with view of the beach and main street to the right. Not too noisy at night. Ideally situated and suitable for families. Just got back from a week staying at the Mimosa. I was a little worried to begin with having read fairly negative reviews of the hotel. However both myself and my partner were very impressed with it, the hotel, rooms pools, food etc was really nice and very high quality, perfect for everyone! The hotel was brilliant, the reception was big and spacious, first impressions were very impressive with friendly staff welcoming us, despite arriving in the early hours of the morning. The pool, surrounding area and reception/bar were all very clean and spacious. The room we had was in the front block and although a little on the small side, was very clean and modern. The sheets were changed every other day and the maid emptied out the bins every day. There was a hairdryer included in our room and i assume it is the same in each other room. We did have a shower curtain (unusual in greece as they are not usually provided as the greek people believe they harbour bacteria, it is the same with bath mats) although the shower did get a little slippery so be careful! the bathroom did tend to get a little flooded but this is again very usual for greece and it drains away eventually. Breakfast was served between 8am - 10am and is standard continental style, toast, cereal, scrambled eggs on toast, beans on toast, crossiant and fruit salad - simple but nice, a full breakfast and bacon/sausage sandwiches are also available at a small charge. The evening meal is three courses with a choice of 4 starters, 4 main courses and 2 desserts. The meals are not huge but are enough to fill you up. The food we had here (including the impressive snack menu) were lovely. Overall this was a fantastic holiday, the location of the hotel was amazing, right accross from the beach and in the middle of the action. It's not too noisy although the entertainment at the hotel occasionally went on quite late. I would definately come back here next year. 10 out of 10 in all aspects!! 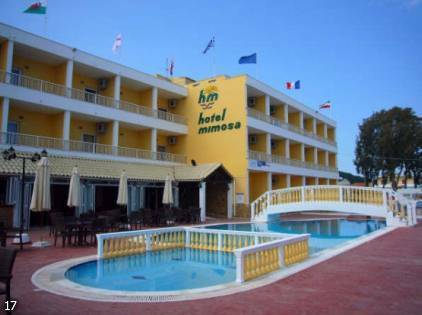 just returned home from a great holiday at the mimosa hotel,great location,very friendly,basic but clean,food good,we would definetlly stay there again, (a little advise though be prepared for the mosquitoes). very depressed to be back home. I have just returned home from two weeks at the mimosa. This was the third time I have stayed here and it was everything I remembered it being. I took my mate with me for the first time and we both had such a laugh. The room overlooked the sea and was lovely to wake up to in the morning. The hotel was clean and the food was lovely, although we never made it up for breakfast!! But most importantly the staff at the hotel were outstanding. Everyone was always so friendly and always made an effort to speak to you and have a laugh, no matter how many hours they worked a day. The waiters and waiteress (sorry don't want to attempt to spell your names!! ) were great and the service always came with a smile. Special mention to Spiros behind the bar who was fab and you were guaranteed a laugh, especially if bingo was on!! I have booked to go back in October and am counting the days!! Best holiday ever, can't wait to see you all again. food was ok, what you would expect from a two star hotel, the service was normally friendly espeacially the reception, spot on. The rooms let the hotel down, although i was told the back end appartments are much nicer, we was at the front. Overall, we cant complain, if the hotel brings all the rooms up to date, it would possible upgrade the hotel as a three star. So get to work and we might go back Sidari its self is a liverly resort, any of you clubbers out there go and live a little, the beach is clean, the musics great espeacaillys MOJO s bar, great DJ Billy, also mention Ice and Bedbar, great music, even if an old soul dancer like me loved iT. GO and vist this lovely part of GREECE am sure you will love it. Myself and my partner Lee, 36 & 37, have just returned from the Mimosa Hotel on the 21 September 2004. We felt that the location was excellent as were all the staff, they could not do enough for you. 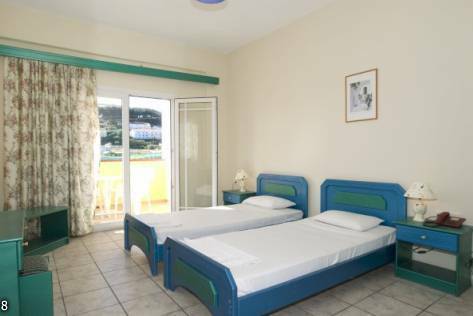 The room was very clean and quite spacious compared to other Hotels we have stayed in on other Greek Islands. We didn't make breakfast,and we only had one evening meal as we prefer to explore the resort and try out other restaurants. The meal we did have was excellent though, as were all the restaurants. We particularly enjoyed the Olympic restaurant, where the staff entertained their guests with Greek fire dancing several times a night. The only downfall with the Hotel was that it had Karaoke on every night, which was a bit tedious after a while. On the whole, an excellent holiday! we've just got back from two wonderful weeks at the mimosa hotel and can't wait to go back. the hotel staff are friendly, especially leo and alex behind the bar. alan the entertainments manager is great (and he gave me a cure for my nasty case of p***kly heat), our rep stuart was really helpful. would recommend it to anyone. the food was great, the room was clean, everything we wanted. We have just returned from a fantastic holiday at the Mimosa in Sidari. It was the freindliest place we have been to. All the staff and guests made us feel very welcome, especially George in the pool side bar. Rooms clean and large, excellent air conditioning, and we needed it with 43 temp. Sidari itself is busy at night and has a lovely beach. We reccomend the yellow Boat company on the beach, we had a boat from them and toured all the little bays along the coast. A great way to see the island and get a tan!! Our only complaint would be the breakfasts, we ended up having ours at a bar across the road. Holiday'd at this hotel last year so impressed with it we are going back agin this year. All the staff were so friendly and good fun to be around.Ideal location and excellant value for money loved every minute cant't wait for July. Came bak from sidari mid september ad although we ad a great time, the hotel was not upto scratch, rooms were awful, clean but very very basic. No light bulb wen we arrived at 4 in the morning, electrics hanging out the shower, no shower holder, burnt plug sockets, hotel flooded, no electric 4 1st 2 days, water off at peak times, the list goes on although there are some good things to be said. Cleaners excellent, we always had a chat with her(Well the best we cud bcoz she was greek, i think!) All waitors and barman are great, especially alex, so sweet! Securuity gurad was a t****r and dunt let u do anything that ur supposed to do on holiday eg, jump in the pool at 6 am with ya clothes on, make any noise wotseva, blah blah blah! food great, only got up 4 breakfast once, wasnt worth getting up 4! nite time meals excellent, greek choices and excellent quick service. Arrived back on Saturday after a 2 week stay at the Mimosa. Lovely clean hotel, Waiters made us laugh especially Vassilias, Stelios, Spiros x2 and Alex. My wife instantly fell for the charms of Leo, who worked behind the bar. It was as much as i could do to drag her away. Mike the owner and Alan the compere both worked hard to make our stay superb. Never had a problem with noise, but i will apologise for returning to the hotel at 4.30am singing. If you're reading this (and you know who you are) Sorry to those i woke up. If we ever return to Corfu The Mimosa will be graced with our presence again. Just got back from a 2 week stay - One of the best holidays we have had. Took 4 teenagers 14, 16 and two 18 year olds the resort was great for them (Bars and clubs within 2 mins walk). Hotel was clean and very quiet (considering how close to the nightlife it is). Staff are extremley friendly and helpful - especially Alex in the bar and Vaslie the waiter. Kids can wait to go back. Our 2 week holday at the Mimosa was one of the best we have ever had.The breakfast was OK but the evening meals are wonderful with a lot of choice,but the best thing about the hotel is the staff.Mike the owner was very friendly so was Alan the compere but most of all ,the waiters and barstaff are the most cheerful and friendly I have ever met.I will definitely return with my wife,and my daughters who came with us are planning to go with there friends. We came back from Sidari at the end of July having had a great couple of weeks at the Mimosa. The food is fine - comparable to most of the other bars and restaurants in Sidari anyway - apart from the 'English' breakfasts. It really would be better if they served a continental (not just a slice of toast) or Greek breakfast. Anyway, apart from that the location was ideal, everything was clean. The best feature, however, was the staff. They were so friendly and helpful and created a really friendly atmosphere. The Sunday night 'cabaret' singer, Ian Dewart is best avoided - absolutely awful, and the hypnotist George Lord is quite nasty, but Alan, the compere, was great and although we started off thinking the entertainment was a bit cheesy, we ended up loving it. We're seriously thinking of going back next year. Lots of people do. were only sorry the holiday ended. We came back from the mimosa 3 weeks ago. And we liked it. Cleaners are excellent beds changed every day. breakfast wasn't a typical english breakfast but then again you are not in England. Couldn't knock the evening meal though, a variety of choices to suit everyone. waiters were very friendly and very entertaining doing the fire dance. Did anyone spot the massive finger nail on one of the waiters!!! If you want to save on money go to the supermarket at the front of the hotel and get big bottles of Stella for 1 euro. 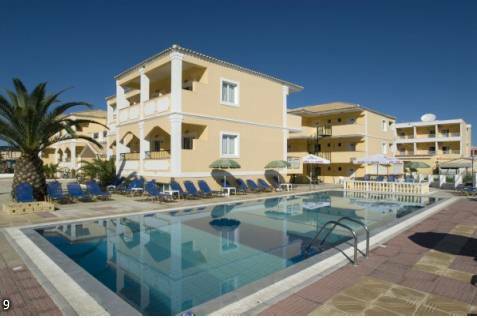 Sit by the pool and relax then go and watch the entertainment in the bar. Just got back from holiday. Me and my boyfriend enjoyed our stay at the hotel. We got a ground floor room with a sea view which we thought was great. We were able to nip over the balcony to jump into the pool for a swim. The room was basic and we didn't pay for air condtioning although we didn't really need it, we just kept the mosquito door shut all the time which kept the room cool. I have to admit we had a problem with our toilet for the first couple of days but once this was sorted out we had no further problems. We also had ants but this was no different from home, but we soon got rid of them! We found the food to be excellent, there was a great choice of food and we also got vegetables although we are fussy and don't eat them, i really enjoyed their roast potatoes - yummy! The staff were very friendly, cannot fault them especially Alex he was so friendly. We didn't stay in the hotel for the evening entertainment as it wasn't suited to our age group (early 20's) but the hotel is close to all the bars, restaurants, sea etc so it was no problem to us. Overall we had a great stay and would even consider staying there next year. we returned from Sidari on 21st July 03.Although we didnt stay at the Mimosa(we stayed at some scanky Manos apartment down the road!! )Our family,mum,dad,claire 16,jon 12,bex 9 spent a lot of our holiday,both days & nites at this hotel.we found it extremely friendly,especially the bar staff,who loved the kids and made every1 feel very welcome.the hotel has 2 swimming pools that we couldnt keep the kids out of,and loads of free sunbeds!lunchtime snacks very reasonable prices,and couldnt fault the food,about �2!genuine happy hour between 5 and 6pm,buy 1 get 1 free!we ate at the mimosa on many evenings,a 3 course meal for approx �4,who can fault that!we made many friends wiv ppl stayin at the hotel,they all said the rooms were basic but nice and clean,only prob was no air cond unless you paid extra,but fans easily hired throughout sidari(v.cheap)!all staff were great,especially alan in the evenings.the greek dancers were great,and have a great nak of gettin ppl 2 dance on the tables! !All the waiters were a great bunch and a gd laugh(especially stellios,watch out 4 him girls)!great location,in the centre of sidari,over the road from beach,and many bars and clubs,no age restrictions, and free shots if u get up and dance on the bar! !we really miss every1 and will be goin bck next year,cant wait!